Its summer! Picnic season! Here is on of my favs from an article this morning. Perfect for a gluten-free, paleo diet if that’s your thing 🙂 Will post the article for other amazing recipes. Mix all of the ingredients, except your fat of choice (oil) together in a bowl until well incorporated. Form into 1-2 inch balls (makes about 20 balls). 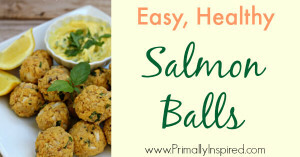 Add your fat of choice to a baking pan and then place your salmon balls on the pan. Lightly roll the salmon balls in the oil so they get coated. We love to eat these with an easy homemade dipping sauce! Add 1 tablespoon of fresh herbs (I usually use dill and/or basil) to ⅓ cup mayo. You can also use sour cream or Greek yogurt in place of the mayo.